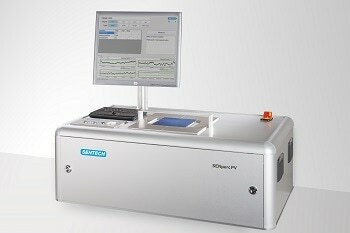 SENTECH presented the new, innovative SENperc PV – a metrology tool for quality control in PERC solar cell manufacturing. Al2O3/SiNx layer stacks and single films for passivation of PERC solar cells are measured. The SENperc PV was introduced for the first time in China. It was awarded at the on-site session of the SNEC Show as one of the “Top 10 Highlights” as innovative product launch in 2016. Dr Gruska, Application Manager at SENTECH introduced the new quality control tool. The SENperc PV measures thickness and refractive index of single Al2O3 and SiNx films and Al2O3/SiNx layer stacks on the back side of PERC solar cells. Easy recipe based operation and statistical process control make the SENperc PV the ideal tool for quality control of PERC passivation layers. Direct and long-term feedback to the operator for immediate intervention drew attention to the new SENTECH tool at SNEC PV Power Expo. Further, SENTECH promoted the widely used and well-known SE 400adv PV and SE 800 PV. Over the last years the SE 400adv PV became the worldwide standard for quality control of antireflective coatings on the front site of Si solar cells. The SE 800 PV is the ideal tool for R&D of multilayer stacks for passivation and AR coating of Si solar cells. The SNEC PV Power Expo is important to SENTECH as one of the world leading photovoltaic exhibitions. This annual event takes place in Shanghai, China and attracts several thousands of visitors yearly. At 2150,000 sqm more than 1500 exhibitors presented innovative solutions and new products for the production of clean and sustainable energy. SENTECH gained very good response for its powerful quality control tools for present and future challenges in silicon photovoltaics. SENTECH wants to thank the numerous customers for visiting SENTECH at the SNEC PV Power Expo 2016. We are looking forward to a successful year 2016 for Photovoltaics.